Enjoy the comic vaudeville skit, Rudolph and Rosie at the Roller Rink, performed in 1907 by Ada Jones & Len Spencer. Announcement "Rudolph and Rosie at the Roller Rink, by Ada Jones & Len Spencer. Edison record." Ada Jones and Len Spencer recorded several dozen highly abbreviated vaudeville skits for Edison  and dozens more for other major record companies. Usually heavy with ethnic overtones, the format was easy to spot: a brief introduction to the two characters, a few (generally corny) jokes, a chorus of a song followed by a joke, marriage proposal, or both. Good fun squeezed into a 2-minute wax cylinder recording. Sung on this month's cylinder by Ada Jones (although sung to Rudolph instead of 'Charlie'). Presented courtesy of the Lester S. Levy Collection of Sheet Music. No. 9503, "Rudolph and Rosie at the Roller Rink," by Ada Jones and Len Spencer, is a Dutch character sketch, declared to be the best Dutch sketch since "Heinie." The title and the names of the artists making the Record are a sufficient guarantee as to its fun-making qualities. 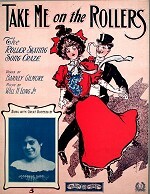 An opportunity is given Miss Jones to sing the new skating song, "Take Me on the Rollers," written by W. H. Long, Jr., and Barney Gilmore.